(272 x 380 mm) 11.7 x 16.5 in. This pen and Indian ink drawing on art board is a view from the kitchen of John's house in Torquay, looking through the bamboo curtain into the hall. 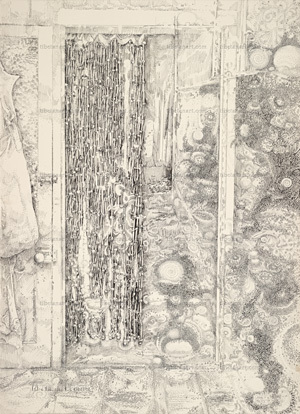 The glass door on the left led down to his basement and garden, which along with the bamboo curtain that hangs in a separate doorframe, are almost the only figurative elements that appear in this drawing: for the floor and walls of the kitchen and hallway are filled with minute areas of swirling calligraphic detail.